There are places in the world that impact us because of its beauty, like Machu Picchu; But many of the people who travel to the Inca city do not always remember the amazing Temple of the Sun or the Intihuatana. If you can get one of the 400 tickets available to climb the Huayna Picchu Mountain, you may remember more “the stairs of death“, and although no one really has died on these stairs, we are sure to remember their majesty and how intimidating they can become. Many people (with nerves of steel) have a special interest in Huayna Picchu Mountain, not only because of the adrenaline of ascending the steps, but because of what they find at the end of them. The Temple of the Moon is one of the most amazing constructions of Machu Picchu; But in reality there is nothing compared to reaching the summit of the mountain; There are people who have experienced a radical change in their lives, after reaching the top of Huayna Picchu. They are not only the stairs but the places to which they lead; We are certain that you will not be able to forget the stairs of death in Huayna Picchu in a long time. This staircase looks like a painting by MC Escher, it is completely intimidating, it is not suitable for people with vertigo, and there are cases of people with panic attacks; And the worst, is that they stand between you and the place where you want to reach. Look where you step when you climb these stairs; In fact everything will be fine, until you remember that the stairs that took you to the top, are your only way down. To reach the Temple of the Moon at the top of the mountain Huayna Picchu, you will face 183 meters of rock steps; Were sculpted more than 500 years ago on one side of the mountain and are covered by clouds. Hold on, because one side of the stairs will find a steep and humid wall and on the other, a fall of hundreds of meters directly to the Urubamba River. But do not let these stairs prevent you from reaching the top of Huayna Picchu; There is only something more spectacular to see Machu Picchu from the front, and it is to see it from above; Also enjoy the sense of accomplishment, after reaching the last step. Everything that goes up has to go down, it’s simple logic. If there is anything worse than climbing the stairs of death, that is to go down by them. The road at the end will take you by a kind of loop, this will make it possible to avoid the travelers that ascend at that moment; However one way or another you will have to descend through the same site, and you may actually notice the verticality of the stairs (60 ° inclination). You will need your maximum concentration on the stairs and only on the stairs. You will feel that a false step and “puf” goodbye. Okay, not right away, it will drop about 300m. Before “arriving” to the Urubamba river. But as we said before, no one has died falling from this ladder; In fact, to reach the top, you just need to want to be there and a healthy respect for mountains and extreme heights. How many people have died on the stairs of death in Huayna Picchu? The staircase is surrounded by myths (like everything in Machu Picchu). Among the things that are said, it is said that it is possible to see UFOs from the mountain Huayna Picchu; but no dead person. 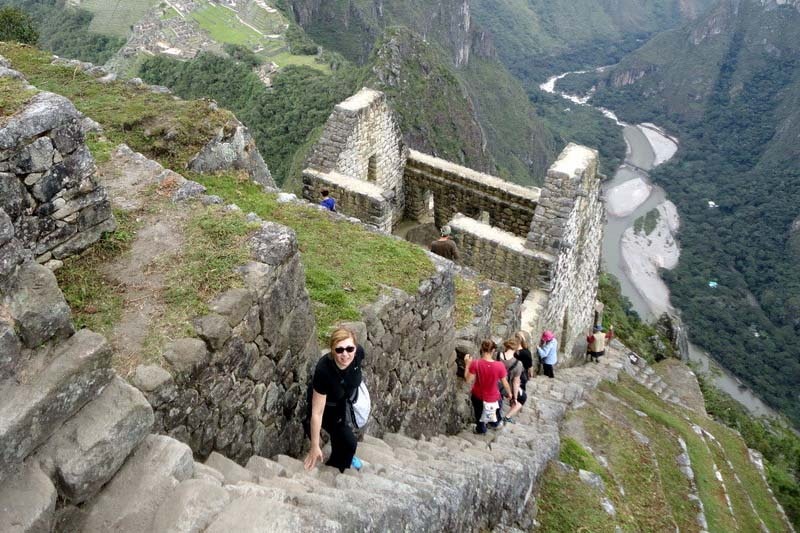 These stairs are wonderful in themselves; There are so many people who want this experience in Machu Picchu, that the Huayna Picchu Tickets must be booked 6 months in advance. If you want to see Machu Picchu from above, but think that you will not be able to overcome the stairs of death or your fear of heights, you may be interested in ascending Machu Picchu Mountain ; This mountain has broader, less steep paths, and does not have a ladder of death. Many people are looking for this type of experience, so we present a list of the 10 most terrifying stairs in the world, not suitable for people with vertigo. The steps of the waterfall – The Black Forest, Wurzburg, Germany. Steps of the Canyon – Pailon del Diablo, Ecuador. Stairs of death – Huayna Picchu (Machu Picchu), Peru. The Chand Baori Well – India. Stairs of the Elbe Sandstone Mountains – Dresden, Germany. The Rock of Guatapé – Antioquia, Colombia. The Haiku Ladder – Oahu, Hawaii. 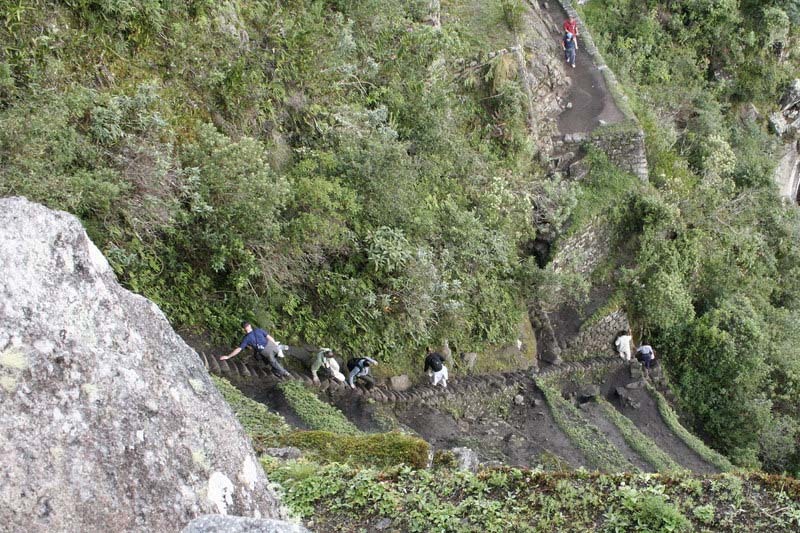 Floating steps of the Inca Trail – Peru. Stairway Vía Crucis – Bermeo, Basque Country, Spain. Spiral staircase in the Taihang Mountains – Shanxi and Henan, China. ← Who can climb the Huayna Picchu?